We’ve covered augmented reality app Blippar a fair few times in the past, most recently when it partnered with Walkers Crisps to provide weather forecasts, which followed its victory at Le Web’s startup competition. Now, the London-based startup has reeled in Warner Bros as the latest big-name brand to tap Blippar’s technology. This link-up will let Hollywood powerhouse market its movies through attaching content to everyday objects which users scan using nothing more than their smartphone. First up, Warner Bros has released a trailer around The Campaign, a new movie starring Will Ferrell and Zach Galifianakis as two Southerners trying to gain a seat in Congress. Topical? You bet. 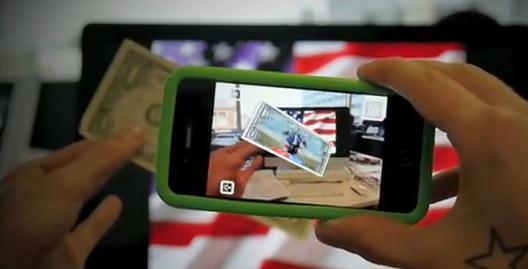 But the interesting thing about this trailer is that you view it by scanning a dollar bill using the Blippar app installed on your iOS or Android device. It’s a little similar to an earlier partnership with Paddy Power in the UK, that saw the Queen brought to life on £10 notes.